Both travelers were right in their instance, but wrong in their rule. The one must have visited it in a year of drought, the other in a year of rain. A longer residence enabled me to see it in both conditions, and I never saw so violent and complete a contrast. The triennial harvest of wheat, barley, and grain is so overflowingly abundant, that it amply makes up for barren seasons ; and living thus in a land which knows no medium between want and superabundance, seems to have no injurious effect upon the character of the people. They are one of the finest races of the Trans-Indus tall, muscular, fair, and often rosy- cheeked ; and in the evident purity of their Afghan blood, form a striking contrast to their mongrel neighbours the Bannuchis. It is this, perhaps, which makes them personally proud and dignified ; but they are frank and simple in their manners with strangers, and distinguished from all the Pathan tribes with which I am acquainted by a more generous treatment of their women. The dress of the Marwats is the loose shirt common to all Afghanistan; a voluminous trouser, whose folds are gathered together at the ankle in the same way as the shulwar of the Persians, but on a smaller scale, and of a dark striped cotton or silk ; and a chocolate-colored turban. The hue of this latter article is quite a distinctive mark of a Marwat peasant. The capital of Marwat is Lakki, which, in Mr. Elphinstone's map, was at that time correctly placed on the right bank of the Gambilla, but which the modern traveler will find to have migrated to the left bank of that river. The old town of Lakki still boasts a few huts on the right bank, but all the Hindu traders and artisans have deserted it,in order, most probably, to be under cover of the fort, which the Sikhs established on the opposite bank. 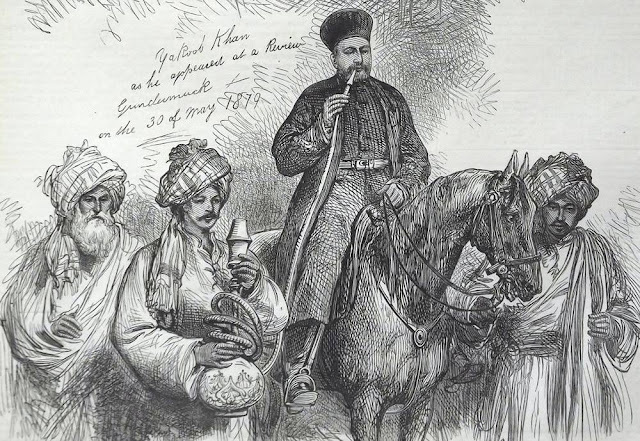 Mr. Masson makes a mistake in placing Lakki on the Kuram, from which river it is between two and three miles distant. To the best of my knowledge, there is not one native fort, walled village, or entrenchment of any kind, to be found among the people of Marwat ; a fact which, to my mind, always spoke more for their bravery than the four hundred forts of the quarrelsome, vindictive, yet cowardly Bannchis. Something, however, must be allowed for the difference of soil ; for the sand of Marwat is as useless for building as the mud of Bannu is excellent: hence there are few or no mud houses even in the villages of Marwat, except those of the chiefs, though in the town of Lakki the shops and houses of all classes are built of that material, favoured by the vicinity of the river. Mr. Elphinstone describes their abodes well : " Half the Marwats are fixed and employed in agriculture ; the rest wander about with their herds of camels, living chiefly in temporary huts of branches of trees, with a wall of thorns, and a roof of straw : some few have black tents of the worst description." And this is not only applicable to their temporary, but to their permanent villages. All are constructed of twigs, branches, osiers, reeds, &c. ; and a stiff wall of thorns, thrown loosely on the ground, surrounds the whole colony, and is closed at night with a rude gate of brambles, which is thrown on one side at dawn in the morning, to let out the cattle. But perhaps the chief characteristic of this country is its excessive drought. There is, i believe, only one well in all the villages of Marwat ! The reason of this is, that the water is so far below the surface, that the people cannot afford to sink wells to it.Instead of such expensive luxuries, they dig a tank outside each village to catch rain-water; but this precarious supply is soon exhausted, and then the drought suffered by the people, in the summer months, is incredible. The only way they have of procuring water is by keeping mules and bullocks, to carry skins to some distant brook or spring ; and the industrious women of Marwat are thus employed all the summer, for nearly twelve hours out of the twenty-four. The poor who cannot keep a mule, have to walk to the water before they can get a drought ! To bring this state of things more fully home to the reader, I will mention the instance of a village called Tatarkhel, on the road from Lakki to the Pezu Pass ; the inhabitants of which have, in general, to fetch water all the way from the Gambila river, or fourteen miles and a quarter, as measured by my perambulator. Mirza Agha Abbas, of Shiraz, the intelligent native traveler, whom I have often quoted, mentions an interesting fact in connection with this subject, which is very characteristic of the religious and hospitable Pathans. " Each house," he says, " sub-scribes a vessel of water for the mosque, and for strangers." Marwat being much more easy of access than Bannu, has never, that I am aware, been able to shake off authority ; but, on the contrary, has submitted to an increase of burdens from every new master. To them succeeded the Nawab of Dera Ishmael Khan, who levied sometimes twenty-seven thousand, sometimes thirty thousand, and sometimes forty thousand rupees from the Marwats. Next came the devouring Sikh ; but though he swallowed up the Nawab of Dera, Ranjeet Singh was either too busy or too cautious to meddle much for some years with his remote Afghan dependencies. I believe Mr. Masson is correct in saying, " Maharaja Ranjeet Sing once marched with an army of twenty- five thousand men to Lakki. He exacted thirty thousand rupees, but did not judge it prudent or convenient to make a permanent settlement in the country, as, it is said, he had contemplated. The earliest certain account that I have of the Sikh proceedings in Marwat is subsequent to Ranjeet's death. About the year 1842, Ranjeet's son (so-called) Maharajuh Sher Sing, deputed Malik Futteh Khan Tiwana, to make some permanent settlement with the chiefs of Marwat. He was a brave, highly intelligent, and singularly energetic man ; but like most natives preferred fraud to force, and was even less hampered with scruples about using it than the generality of his contemporaries at the laxest of all courts. Under a promise to make a " perpetual settlement" of the revenue of Marwat at the low rate of one-sixth of the produce, in kind, yearly, he induced the chiefs to consent to his building a fort in the heart of their country, at Lakki, on the left bank of the Gambilla. Fatal concession ! No sooner was the fort completed, and a trusty garrison of foreigners installed, than Futteh Khan ran unexpectedly short of money, and asked two tuppehs of Marwat, named Byram and Dreyplareh to lend him eight thousand rupees, and he would give them credit for it in the coming harvest. Before that period came, Futteh Khan was superseded by another Governor, named Dewan Dowlat Rai, who interpreted the loan into a regularly established tax, and grafted six thousand rupees more on to it, so that ever after- wards these two tuppehs had to pay fourteen thousand rupees a-year, in addition to the one-sixth of the produce of their fields, for which they had originally bargained. The imposition was rendered still more odious by the method of assessment and collection. He made it a poll-tax ; and it was called by the people, in derision probably, the " putka," or turban, the most honoured portion of a Muhammadan's dress. Every male who was of age was liable to this tax, and consequently it fell heaviest on the largest families. Musa khel, from 15,000 to 20,000 rupees. Musakhel, as will be seen on the map, lies towards Bannu and the waziri hills, and consequently never submitted to regular payments; so that the authorities were obliged to make incursions into it, and harry the people till they came to terms. When I first passed through Marwat to Bannu, I found the smouldering embers of more than one village of this tuppeh, which had been burnt by Dewan Dowlut Raie's orders, for refusing to pay the revenue. In the end they used to compound for all demands, but never would allow either their crops to be measured, or their polls to be counted. In addition to the hated " putka" tax, and the land-tax of one-sixth, the avaricious Dewan imposed on this impatient and newly- conquered Afghan people all the vexatious custom dues of the Sikh system in the Punjab, which averaged no less than eight thousand rupees per annum ; and from these various sources he admitted to me that, one year with another, he obtained from Murwut seventy thousand two hundred and sixty-six rupees. With more correctness I was informed, by common report, that he never squeezed less than a lakh out of it, or 10,000 sterling. My own idea of what would be a fair and rather easy revenue for Murwut is sixty-five thousand rupees. In the beginning of 1847, the rage of the Marwats at the " patka" tax rose to such a pitch, that they rebelled, and laid siege to the fort of Lakki , with the intention of razing it, and freeing their country ; an enterprise in which they were readily assisted by the neighboring Wazirs and Khattaks. The fort was commanded at that time by a very brave Pathan, named Nizam Khan, Khodukka, who first burnt the town of Lakki to the ground, to deprive the besiegers of shelter, and then defended the fort with his garrison for seventeen days, until his master, the Dewan, arrived from Dera Ishmael Khan with guns and reinforcements, and raised the siege. I arrived in Marwat almost immediately afterwards, and forced the Dewan to remodel his system of assess ment, by abolishing the poll-tax, and raising the land- tax from one-sixth to one-fourth, a change which was no loss to the Dewan, and was hailed as a perfect enfranchisement by the people. By a happy accident, a rainy season followed this interference ; and the superstitious Marwats considered it a Divine declaration in favour of the change. Their joy, however, was raised to its utmost when, on my report of the ruin to which Dowlut Raie had reduced every country under his charge, Sir Henry Lawrence removed him from his government, and conferred it on General Cortland. The Dewan was hated through the length and breadth of his province; and from latitude 31 north, on the Indus, to latitude 33, there was no name among the mountain robbers of the Soolimanee Range which struck such terror to the people of the plains as that of their own Governor, Dowlut Raie. Yet he was in high favour with the Sikh Durbar ; and from the great Chancellor, Dena Nath, down to the Punvanuh-Nuvees (writer of orders), there was not an official at Lahore who did not lament his fall. Why? Because they loved his bribes, and did not care a button for his people. Such was the Government which it was the thankless office of the British Resident and his Assistants to control. 1. Source: A year on the Punjab frontier, in 1848-49"
2. 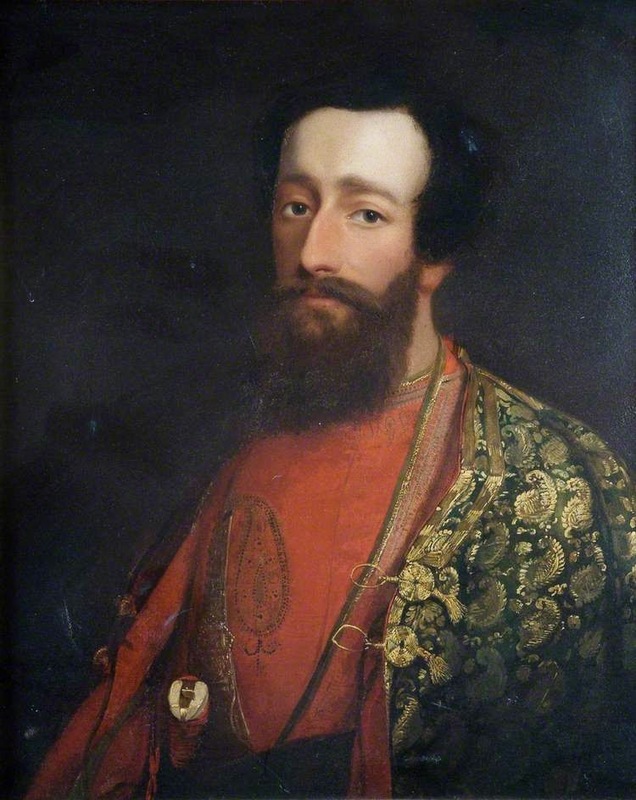 Major-General Sir Herbert Benjamin Edwardes (1819-1868) was an English administrator, soldier, and statesman active in the Punjab, India. He is best known as the "Hero of Multan" for his pivotal role in securing the British victory in the Second Anglo-Sikh War (1848- 49).